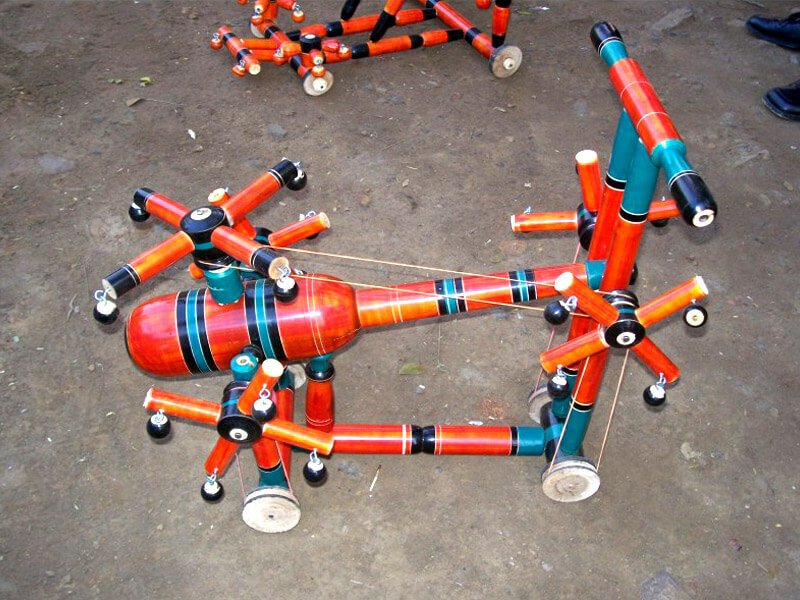 Budni lies on the Bhopal-Pachmari tourist circuit. It is situated on Bhopal- Hoshangabad Road at a distance of around 70 kms from Bhopal in the district of Sehore. 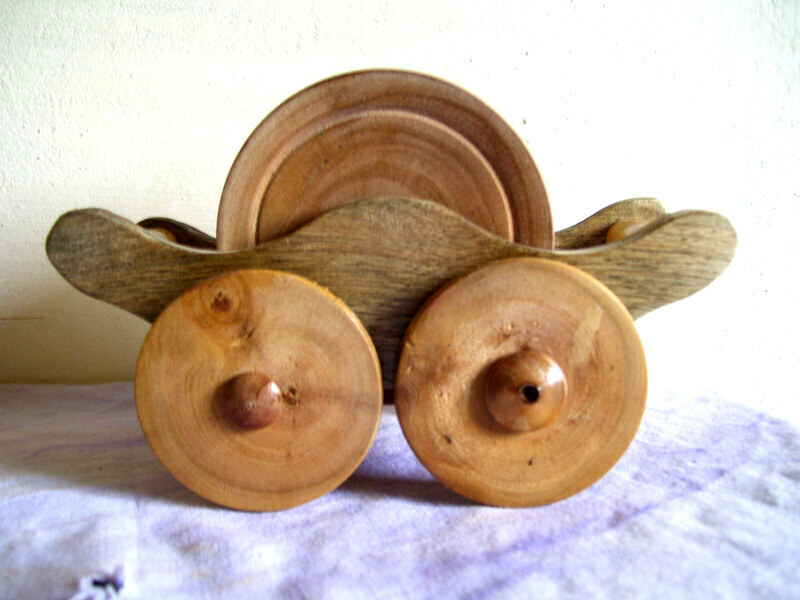 Budni Ghat, the exact site of rural tourism, is legendry for the wood and lacquer craft. 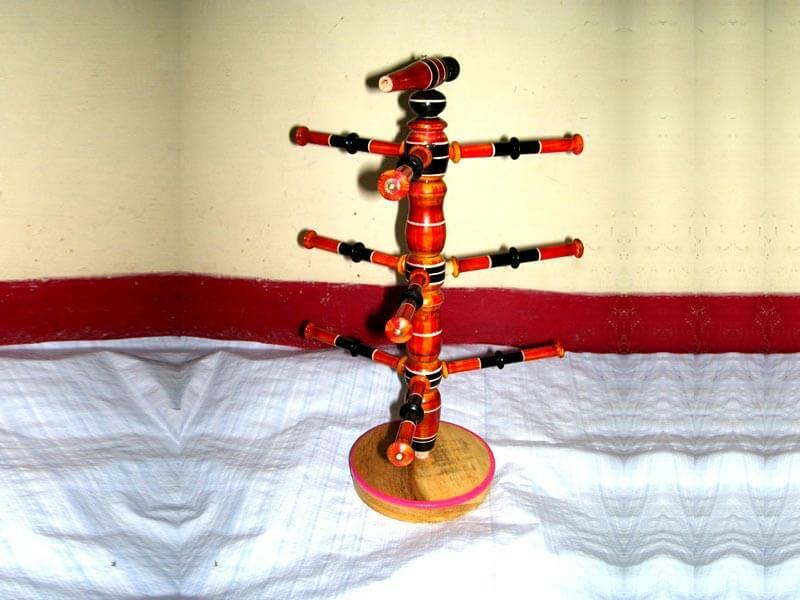 It is located on the banks of River Narmada and almost the entire population belongs to the Vishwakarma tribe, known for wood craft. 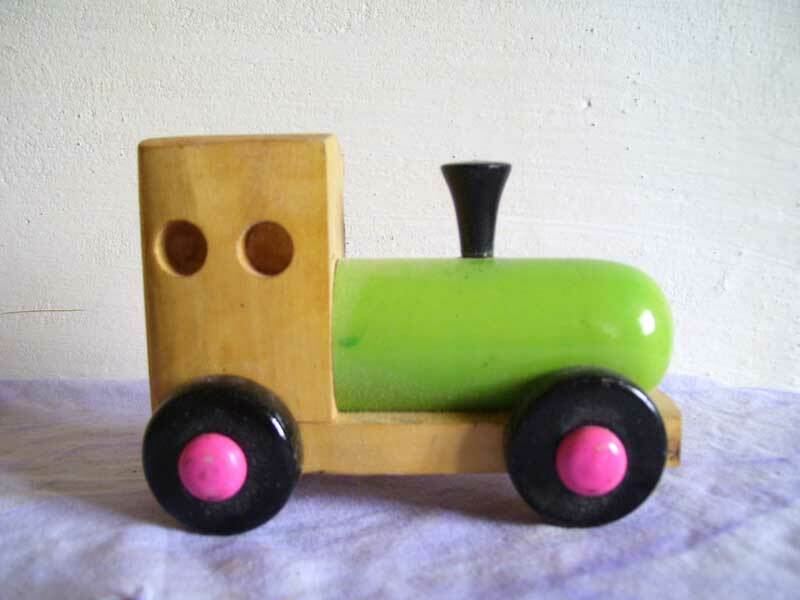 The beautiful wooden toys are made on lathe machine from Doodhi wood, a soft wood species. It is a sacred place for all the festivals linked with Narmada. 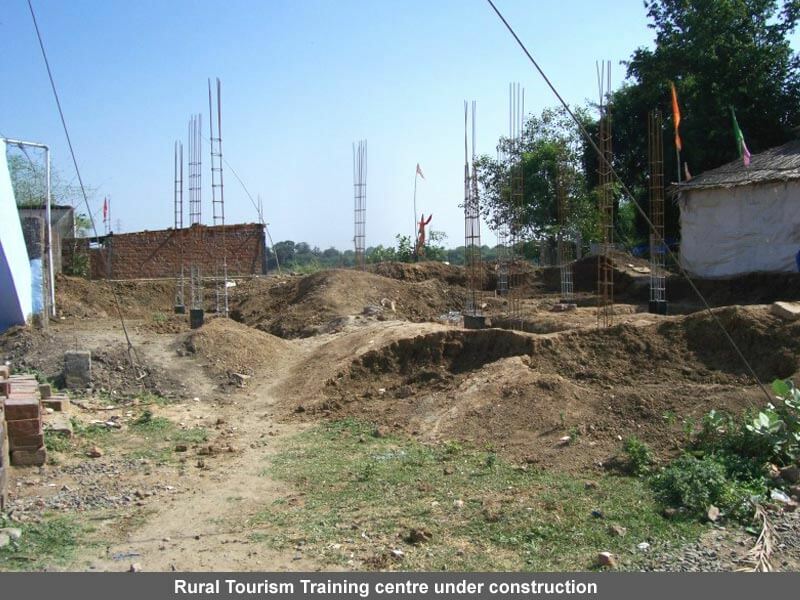 The proximity of Budni to other tourist sites like Bhimbetka, Bhojpur, Salkanpur, Delabadi, Madhai and Pachmari, makes it more attractive. 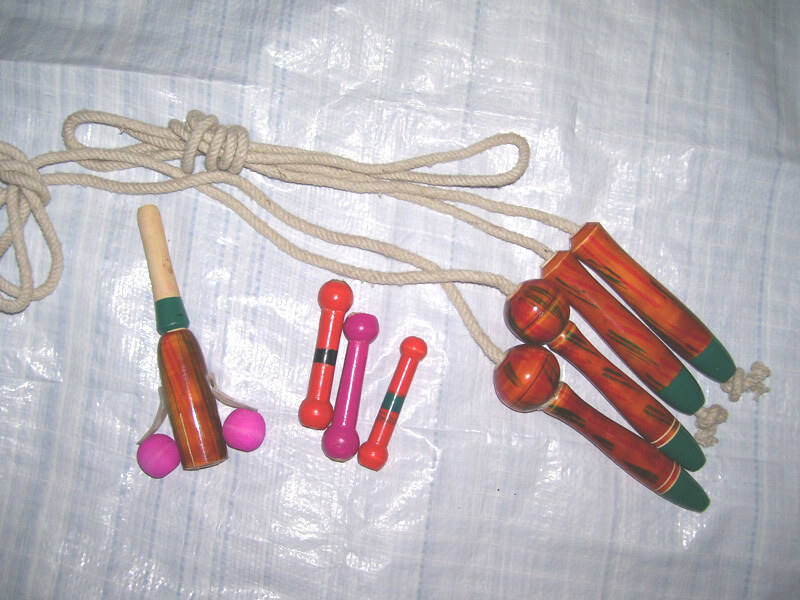 Amongst the special attractions of Budni are woodcraft, 'Lehngi'/'Faag', the folk dance, 'Narmada Ballet, River Narmada, Boating, excursions to Adamgarh, Ginnorgarh, etc. 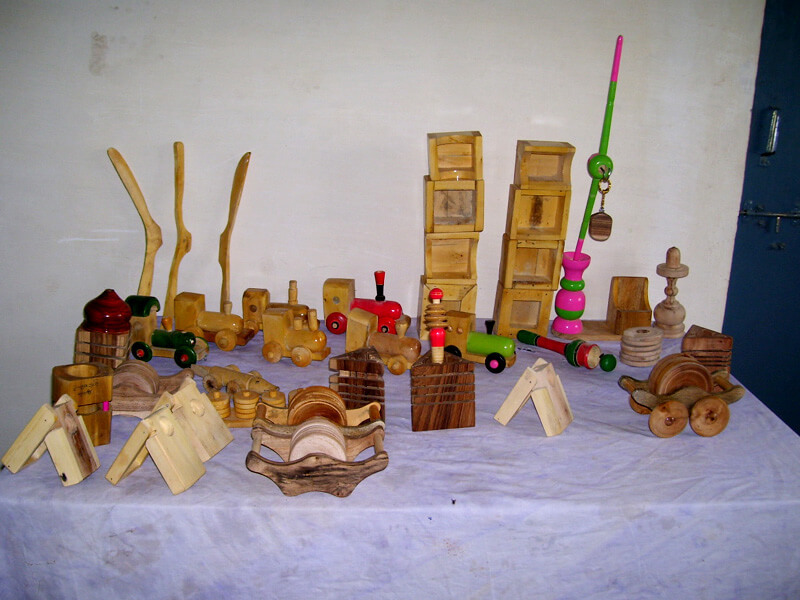 Budni Woods is the brand name for Rural Tourism Budni & its wooden articles. 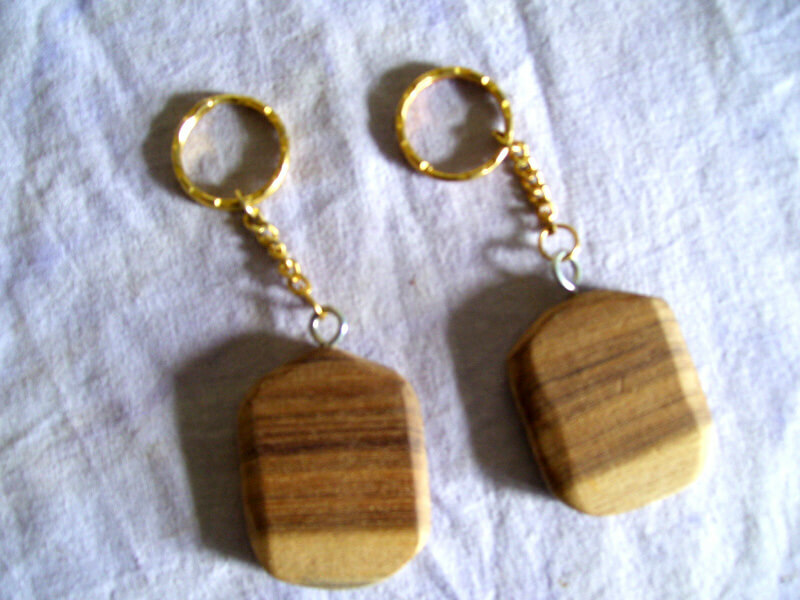 The name "Budni Woods" is coined from the woodcraft, which is the USP of the area. 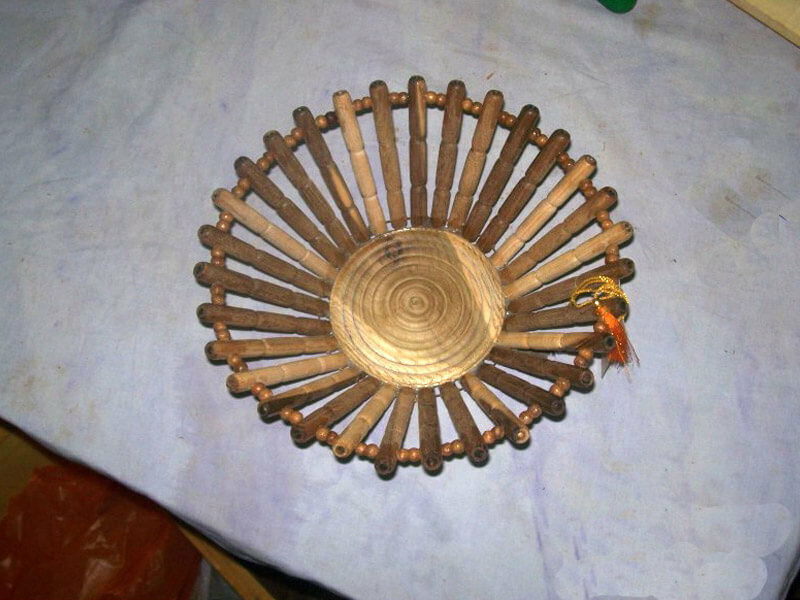 The Malwai dish of 'Dal Bafle' is the speciality of the area. 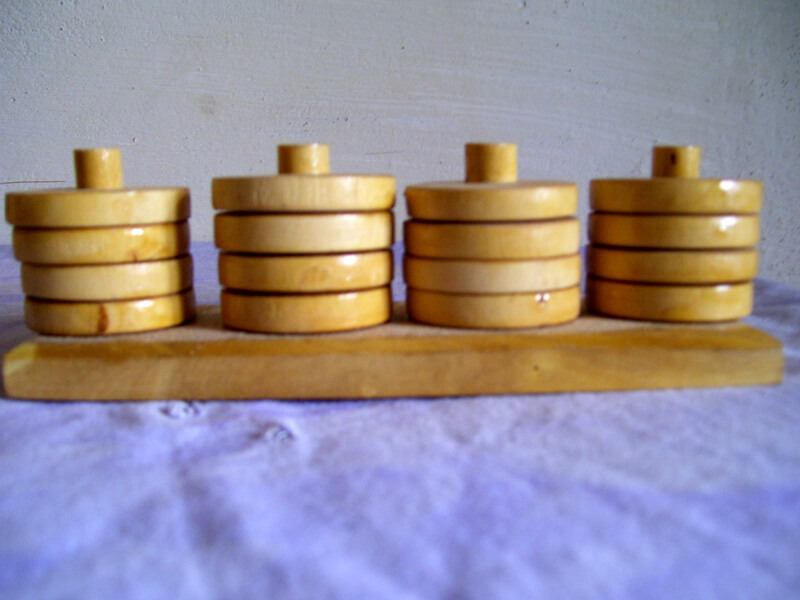 The history of woodcraft in Budni is as old as the history of Budni. 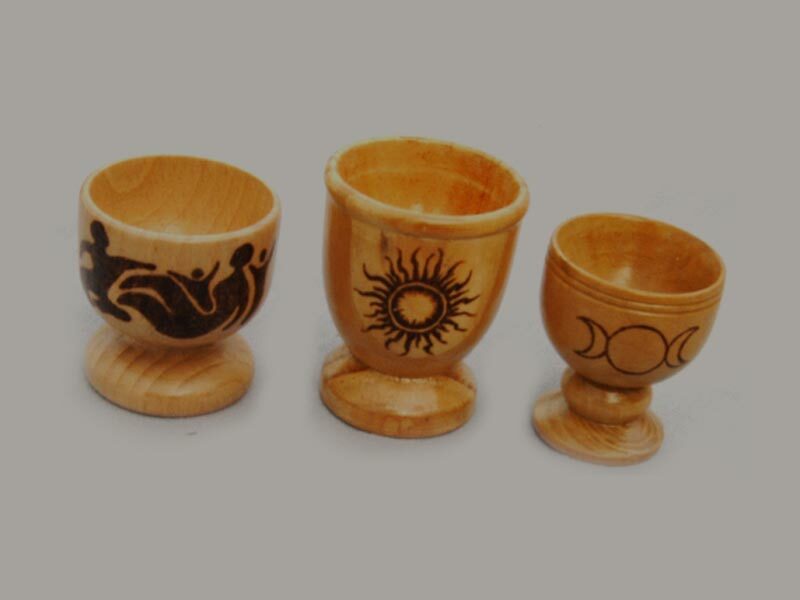 Since centuries the people of Budni are engaged in woodcraft as means of livelihood. 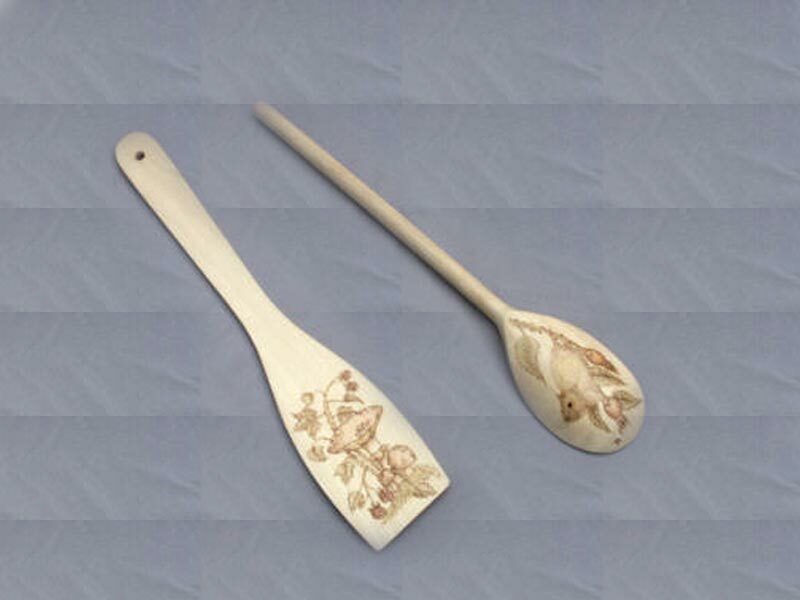 Due to lack of agricultural land in the area, the traditional art of woodcraft flourished as business. 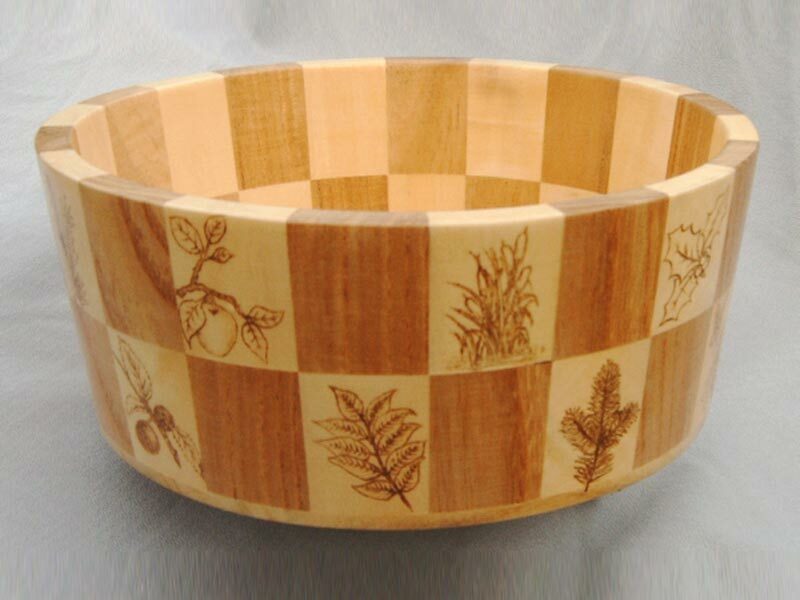 The proximity of lush forest also contributed positively to the development of woodcraft in the area. 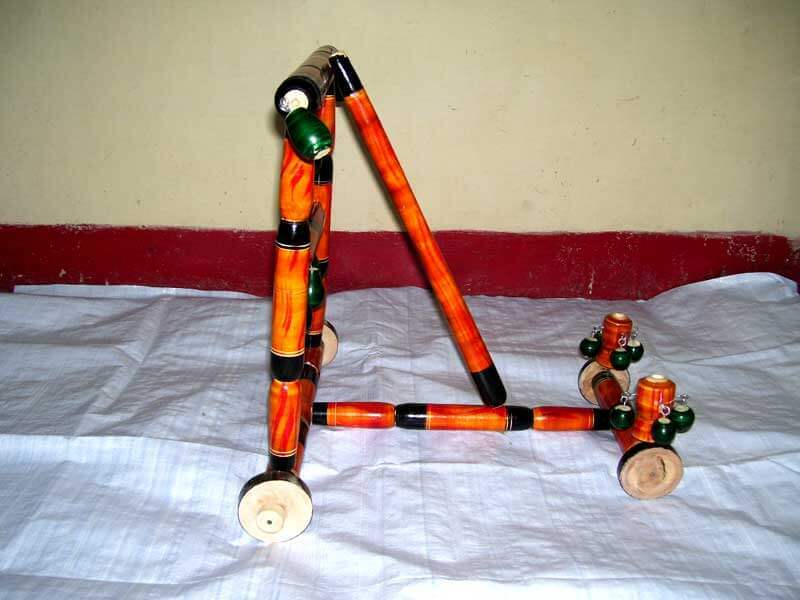 The method of making wooden toys and utility items is traditional one with the use of lathe machine. 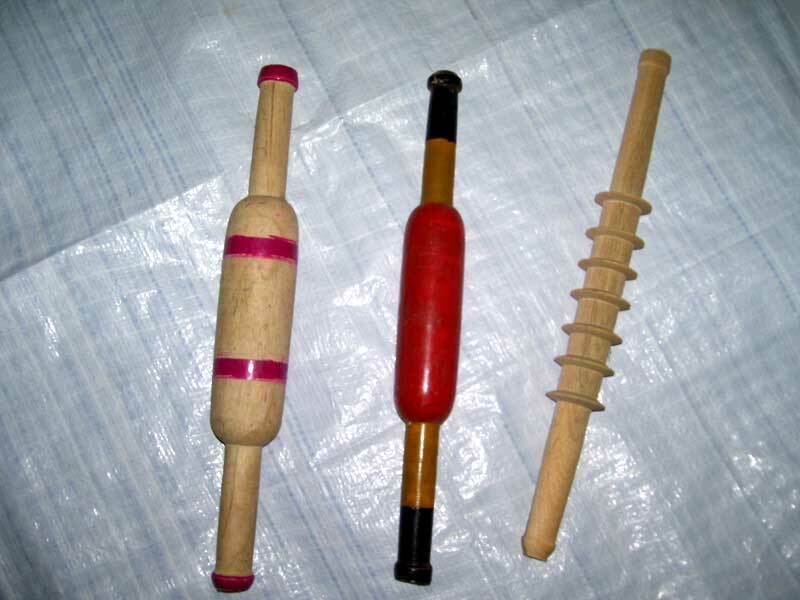 Almost all the artisans are working on the traditional lathe machine and using the laak for colouring the items. A few of them are having the cutter machine additionally. 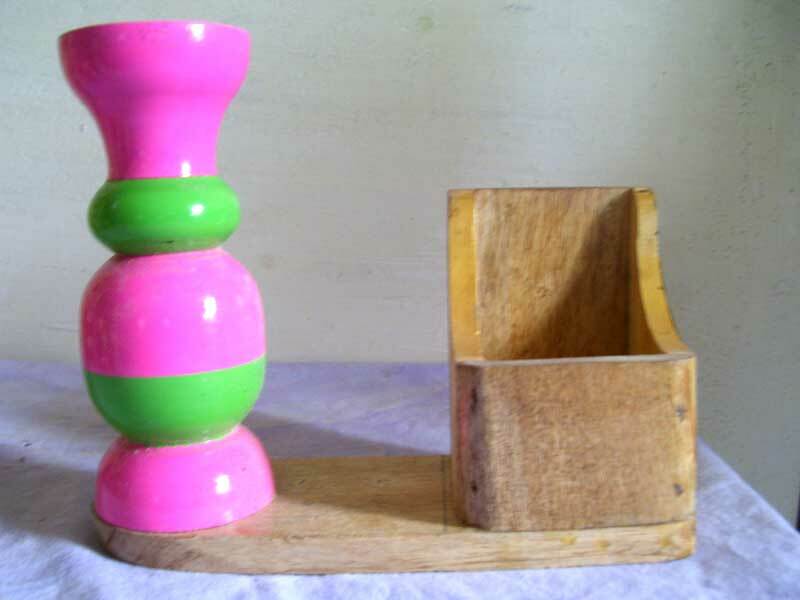 With the turning machine, they make different beautiful and colourful turning (round shape) toys & items. 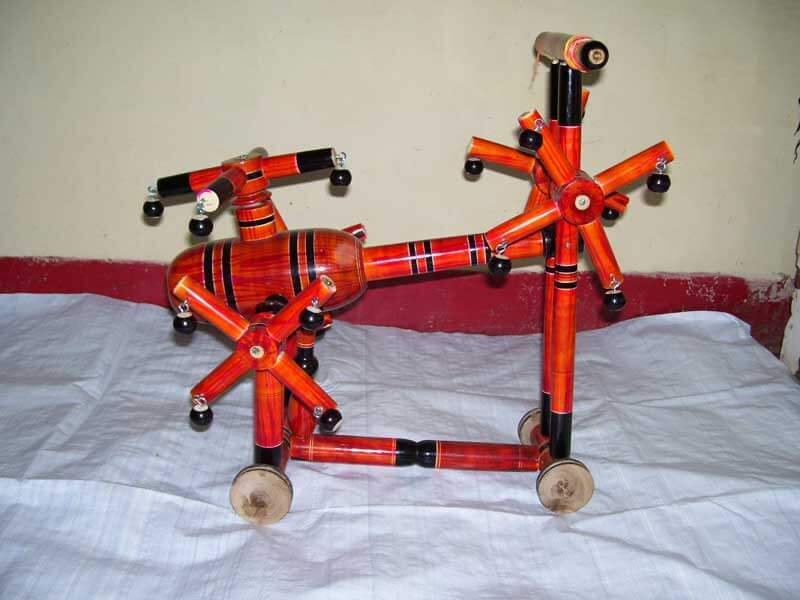 The artisans of Budni were making the traditional wooden items on their lathe machine which could do only the turning jobs and other functions were not possible on the machine. 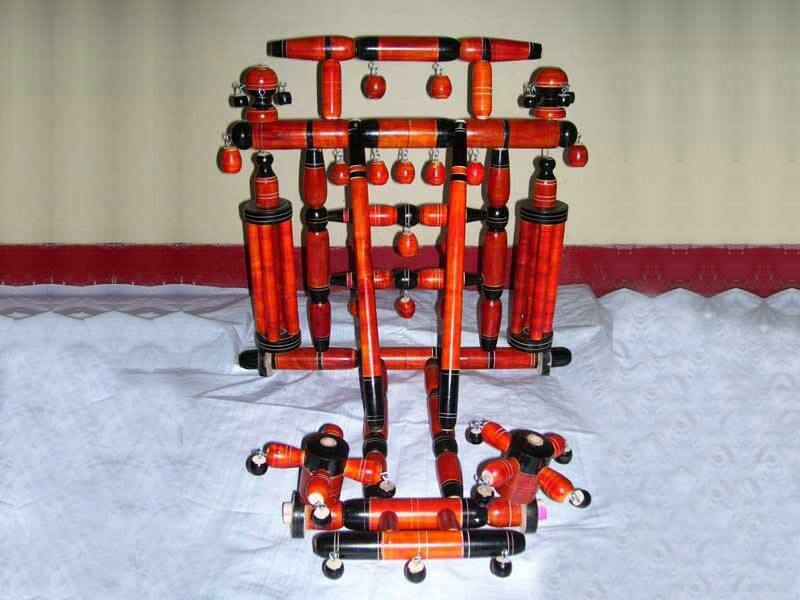 In order to overcome these limitations, IECCI first installed the latest machines and equipments like Universal woodworking machine, Jigsaw machine, Stand and portable drill machine, compressor, reutor machine, and various tools and equipments, etc for the artisans. All the functions of cutting, angle cutting, grooving, slotting, removing external and internal knots, skin finishing, parallel splitting, planning, thickness planning, designing, three side planning, drilling, etc are possible on these new machines. 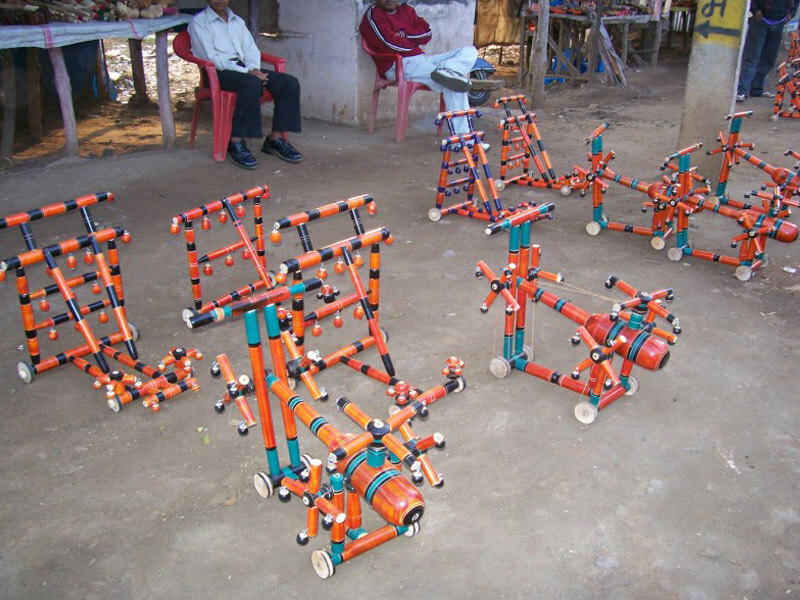 The artisans also participated in the training whole-heartedly and that 71 artisans undertook the practical training on machines and prepared various utility items and toys of latest designs. 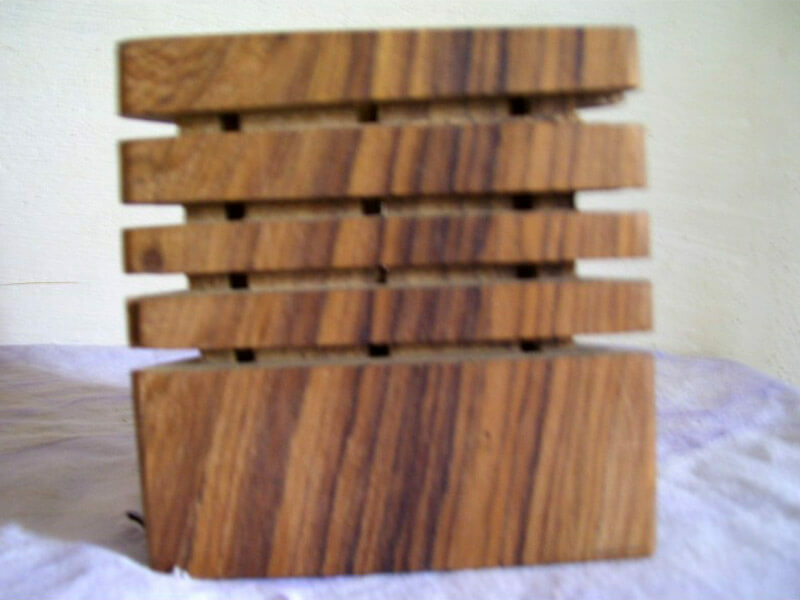 Also, the requirement was felt by the technical experts for Jigsaw cutter for cutting wood into different shapes. 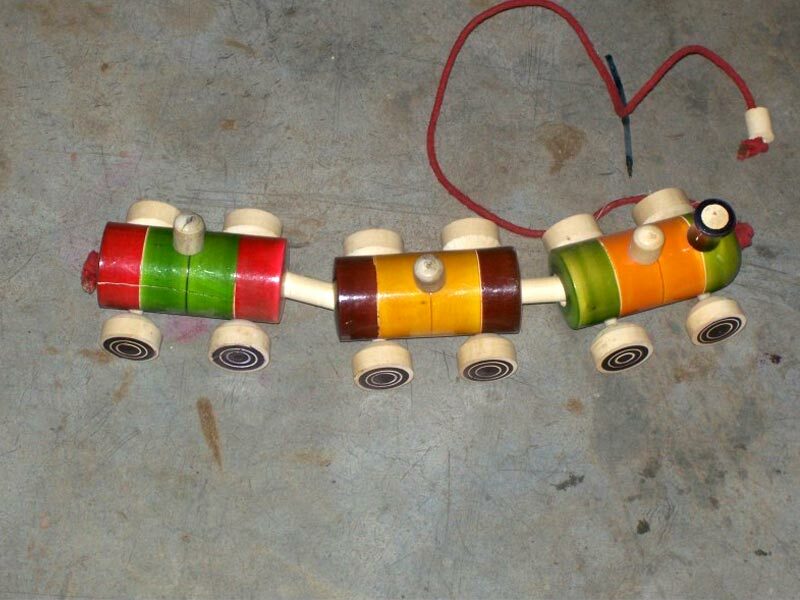 These machines could help in making various educational block games for children. A Warm welcome in Indian style by Budni Woods Committee. 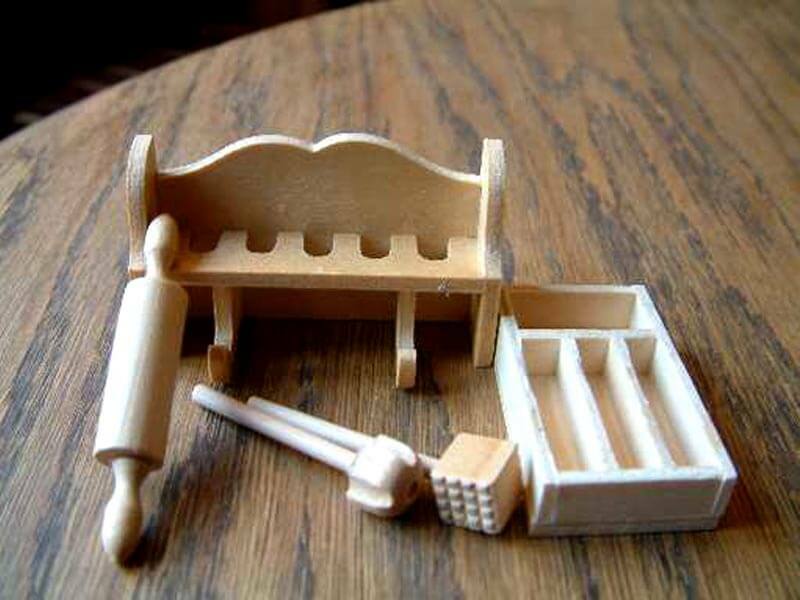 Visit to woodcraft work station. Cultural evening- Narmada Ballet, folk dance- 'Lehngi/Faag', presentations by root artisans at the Ghat. 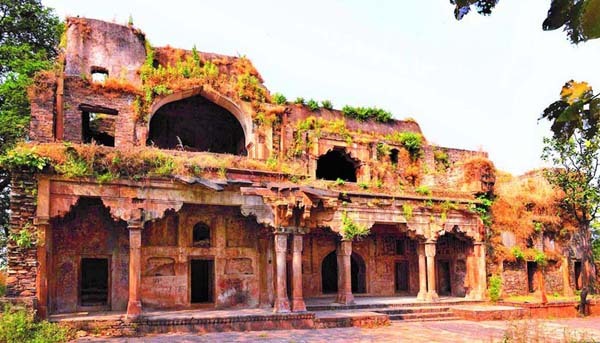 Excursions to Adamgarh-natural and primitive rock shelters, Bhimbetka-World heritage site, Bhojpur Shiv Temple, Salkanpur Temple, Madhai (Satpura Tiger Reserve) and Pachmari, etc. Narmada is considered to be the lifeline of the state of Madhya Pradesh in Central India. Narmada Ghats situated in Budni. It was constructed in nineteenth century along the banks of the river Narmada at Budni. 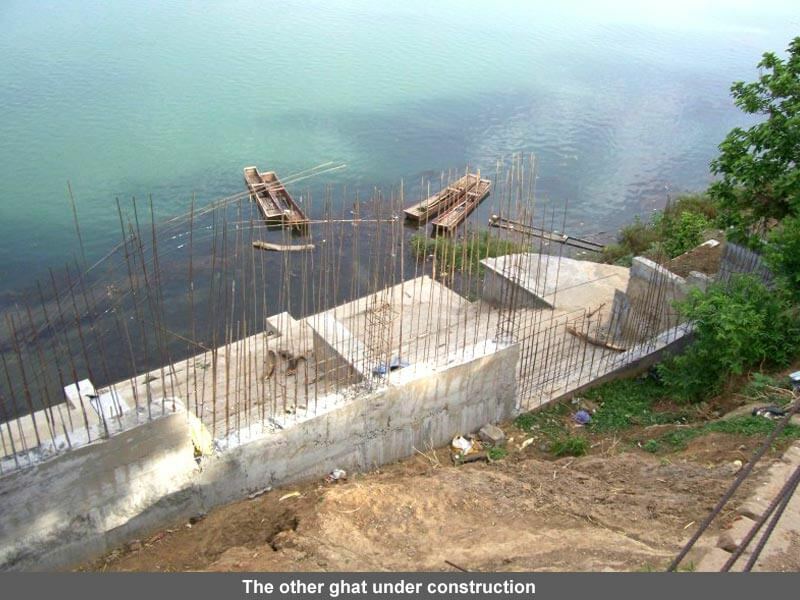 It is one of the most popular ghats in India, and yes most happening place in the town. During Narmada Jayanti celebrations the ghat comes alive when thousands of people converge on the ghats and diyas are floated in the river. Narmada Jayanti is celebrated in the winter season and inaugurated by the Chief Minister or Minister of the state. Narmada Jayanti is a religious festival marking the birthday of river Narmada. It is celebrated with spectacular extravagance in Budni. This great festival is observed during the winter season. Thousand of pilgrims attend the Narmada Jayanti. Every year, a mela held in the bank of Narmada with an exhibition and it continues for few days. A lot of crowd come from the whole district alongwith an adjacent districts. At Budni, the devotees float traditional oil lamps on the waters of the Narmada, from the sprawling bathing ghats. Thousands of people attend the festival. 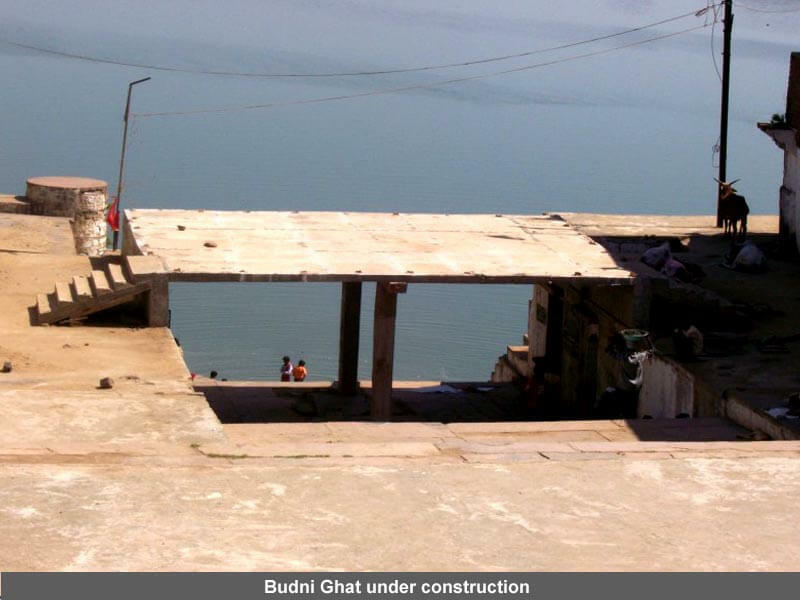 The Narmada has beautiful ghats built on its banks at Budni. You can enjoy boat rides in the Narmada river and relax yourself in serenity of holy river. In the vicinity of the river a large fleet of boats - Curise Boat, rowboats, pedal boats, sailboats and motorboats. So take your pick and spend a while boating on the placid waters of the river. IECCI did the detailed mapping of the service providers in the category of Artisans, Dhaba/hotel staff, taxi drivers, boatsmen, home stay facility providers, cultural artists, etc and prepared the list. The training was imparted to the service providers accordingly. It is a highly venerable house of God located in Salkanpur village, about 70 km from Bhopal, in Madhya Pradesh. The temple is situated on an 800-ft high hillock. The temple here is of Ma Durga Beejasan, an incarnation of Goddess Durga. Salkanpur Temple is in Sehore district near Budni (formally known as 'Buuddha Nivasini'). The temple have more than 1000 stairs and road is also available to reach the top at temple. About four and half kilometer Cement Concrete Road facilitate the pilgrims to drive up to the top. 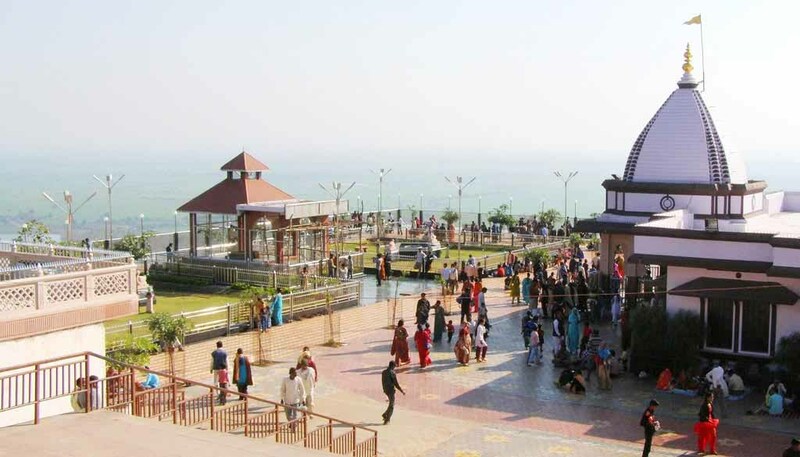 Thousands of devotees come here and climbs up these stairs to get the darshan of Durga Maa. There is a story related to the temple that- when Parvathi was burning and Shiva was trying to save her then one of her body part fell down at this place and a temple was constructed today which is famous as Salkanpur Durga Temple, which has a very rich glory. Sehore Railway Station is on the Bhopal-Ujjain rail route. Malwa Express, Indore-Bhopal Inter-City Express, Narmada Express and Jaipur-Bangalore Express are the main train connections. The nearest major railhead of Bhopal Junction Railway Station is situated to the east of Sehore. Maksi Railway Station is the nearest main station to the west of Sehore. Sehore Bus Station is the nearest bus terminal. Bhopal Airport is 39 km from Sehore. Bhojeshwar Temple is renowned as the Somnath of the East. The richly engraved dome has a brilliant rising and is supported by four pillars. The intricately carved doorway exudes magnificence with the two finely sculpted figures that stand on either side. 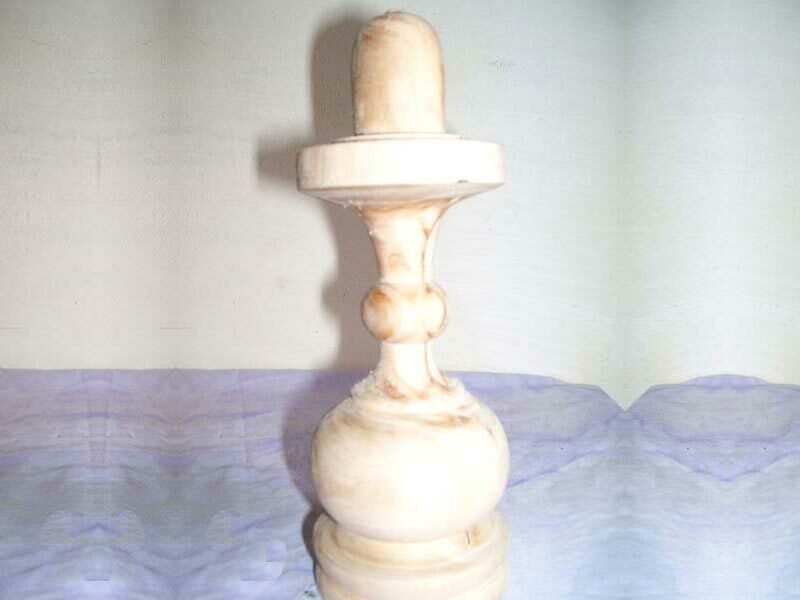 The lingam rises to a soaring 7.5 feet with a circumference of 17.8 feet. Set upon a massive platform and composed of three overlying limestone blocks, the architectural splendor of the lingam and the platform creates a unique impression. The temple was never completed and the earthen ramp which used to raise it to dome-level, still remains. 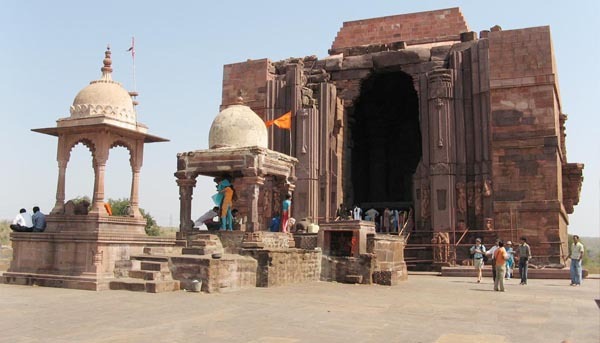 Bhojeshwar Templeexceptionally well designed temple of Bhojpur, Madhya Pradesh. The temple, still incomplete is not incomplete in beauty and magnificence. The Bhojeshwar Temple is an ideal example of craftsmanship in the 12th century. Bhojeshwar Temple is divided into three sections. The exterior has a dimension of 66 feet. The intricately carved dome which too is incomplete is supported by four richly decorated pillars.The simple doorway has two beautifully carved figurines on both the sides. The balconies surrounding the structure are supported by designed brackets and decorated pillars. The sanctum of the temple houses the lingum which is 7 feet tall and 17.8 feet broad. 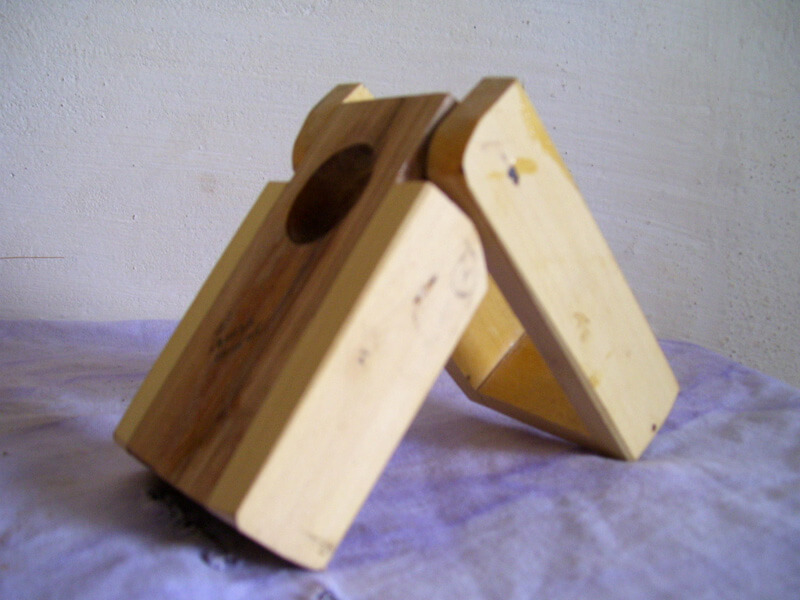 The lingum is placed on a platform with limestone blocks on either side. The Bhimbetka (or Bhim Baithaka) lie in Raisen District of Madhya Pradesh and is 45 km south of Bhopal at the southern edge of the Vindhyachal hills. 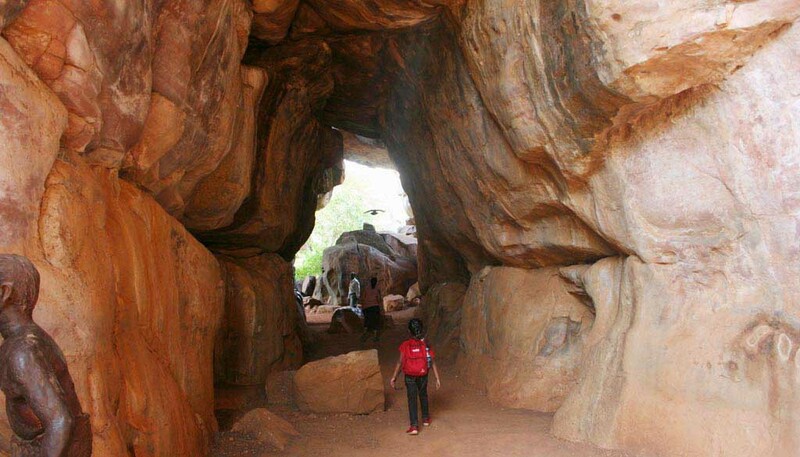 South of these rock shelters are successive ranges of the Satpura hills. The entire area is covered by thick vegetation, has abundant natural resources in its perennial water supplies, natural shelters, rich forest flora and fauna, and bears a significant resemblance to similar rock art sites such as Kakadu National Park in Australia, the cave paintings of the Bushmen in Kalahari Desert, and the Upper Paleolithic Lascaux cave paintings in France. The name Bhimbetka is associated with the historical figure, Bhima, from the epic Mahabharata. The word Bhimbetka is said to derive from Bhimbaithka, meaning sitting place of Bhima, a hero-deity renowned for his immense strength. 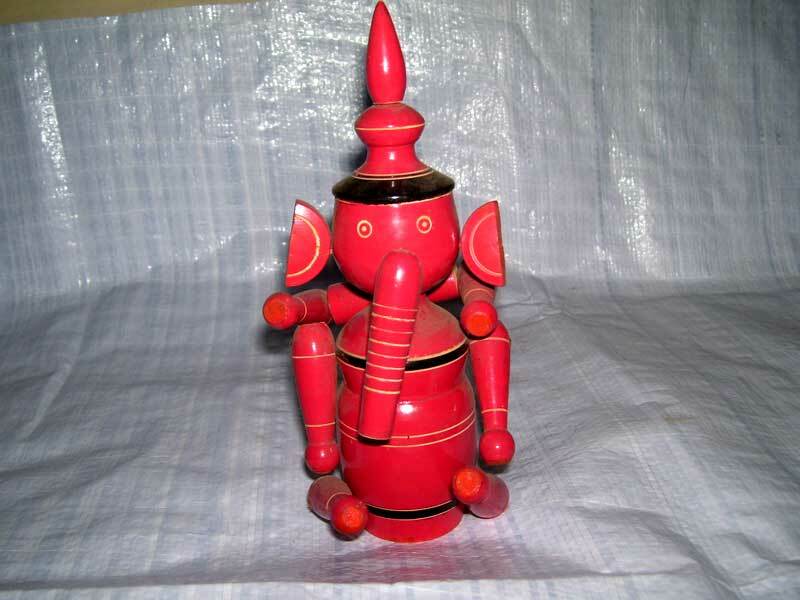 Executed mainly in red and white with the occasional use of green and yellow with themes taken from the everyday events of aeons ago, the scenes usually depict hunting, dancing, music, horse and elephant riders animal fighting, honey collection decoration of bodies, disguises, masking and household scenes. Animals such as bisons, tigers, lions, wild boar, elephants, antelopes dogs, lizards, crocodiles etc. have been abundantly depicted in some caves popular religious and ritual symbols also occur frequently. Delabadi is the heart of Ratapani Wildlife Sanctuary in Raisen district of Madhya Pradesh. It is 55 kms from Bhopal through NH-12. Its star attractions are vast expanses of Teak forests harboring numerous animal and bird species, POW camp, Ginnaurgarh Fort and Kairi Mahadeo temple. The chance of experiencing the dew on the green grass and tree leaves, crossing the cobwebs lined with hanging spiders, multicolored insects dancing through the trails and music resonating from several congregations in the animal world are indeed a rare opportunity to internalize the joy of nature. Delabadi, drenched in the downpour of monsoon showers, shines like the eyes of a newly wed bride in the morning. As if the calls of present do not fill up tourist's time in Delabadi, the past knocks to relive the times and lives of the 18th century. A stronghold of the Gond tribal King, Ginnaurgarh Fort stands testimony to the lost battles by forest dwellers in those times. Sounds amazing ! The word POW (Prisoners of War) } in the tranquility of natural beauty narrates the story of the void experienced by the prisoners almost a century ago. It is difficult to derive whether they were sad in the lone surroundings or happy to rest in the bosom of the green paradise. The places of imminence are Kairi Mahadeo, Bhadbhada Falls, Sunset point and Ran Bhainsa rock shelter around Delabadi. Delabadi forest complex offers the knowledge of ins and outs through video films, pictures of Ginnaurgarh Fort and all about forest life around. The Tiger Exhibition Hall in the Visitor's Center serves the rich visual menu to our very own Tiger State's wilderness. The aura of Tiger territory is spellbinding. Majestic stripes coupled with meaningful looks in the green background are enough to hypnotize whoever encounters this form of life. The gaze disarms best of warriors in the split of a second. Other carnivores living next to Tiger in Delabadi are Panther, Sloth Bear, Wild Dog, Fox and Hyena that may often greet the visitors in an exciting way. The food for the top predator, Tiger, is equally beautiful. The sight of herbivores like Sambhar, Barking Deer, Spotted Deer, Blue Bull, Chinkara and an army of Monkeys paint Delabadi forest canvas into an interesting collage of jungle life. The Guides can explain the inquisitive tourist about habitat and its management strategies in practice. Witness the heavenly abode of the King of the Jungle and enjoy it. 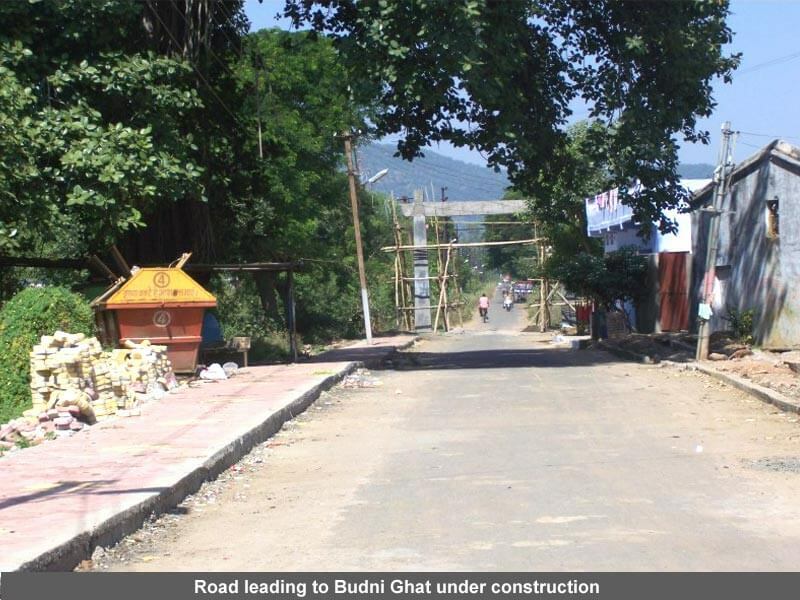 Budni is situated on Bhopal-Hoshanagbad Highway at around 70 km from Bhopal and 7 km from Hoshanagbad. Budni Railway station lies on Western Central Rail track between Bhopal and Itarsi junction. All express trains stop at Hoshanagbad station.